Watch out for the trees. This game exploits the techniques of table lookup to get speed out of BASIC. As the player, you control the race car with a joystick plugged into Port 1. 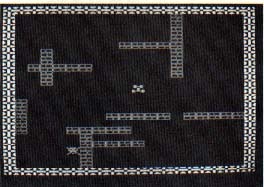 You are supposed to chase the skull, which moves randomly around the playfield to the extent permitted by the walls. When you catch the skull, action is frozen for an instant while you are credited with points, and a tree is planted somewhere in the playfield. Then you begin to chase the skull anew. Obviously, that would be too easy. Now you must avoid the tree, or trees, while chasing the skull. There are two kinds of trees, pine and oak. If you touch a pine tree, you lose points; but if you hit an oak tree, you lose your car and the game is over for that round. Your score--and the high score for this session--will be displayed, and you will be prompted to play again if you wish.